Google has updated Sound Search with some of the neural network-backed AI found in its Now Playing tool. Now Playing debuted on the Pixel 2 in late 2017. The always-listening feature automatically recognizes songs and shows the name on the ambient display — all without pinging a server. Google was able to crunch the fingerprints of some 50,000 songs and store them on the Pixel phones without taking up much space. The result is an incredibly quick way to learn the artist and title for many popular songs. Google discovered that this song fingerprinting method was far more efficient than what it used in Sound Search, which relies on listening via the microphone, sending a sound sample back to Google's servers, performing the search, and then returning the results to the phone. Moving forward, Sound Search uses the same fingerprinting technology found in Now Playing with the full power of its server-side processing. It is accessible through the Google Search or Google Assistant apps on Android phones. Users can start a query and, if music is playing nearby, tap the "What's this song?" tool that pops up. Alternately, people can simply ask "Hey Google, what's this song?" Google says the new AI-powered processing on its servers is much faster and more accurate than before. The new Sound Search should already be available to most Android phones. 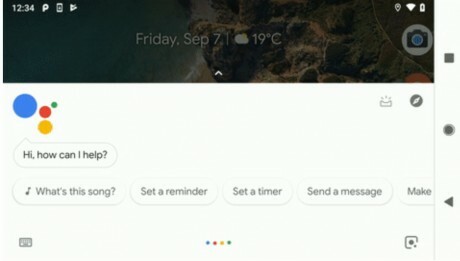 Google Assistant on Android handsets is now able to identify songs playing in the background. As long as the music is audible, querying the Assistant with "what song is this?" will cause the app to listen for several seconds and identify the song. Instagram today made it possible for users to add songs to their stories. Moving forward, a music icon appears when users add a sticker to a photo or video within the Stories tool. Google says it will update both the Pixel 2 XL and Pixel 2 smartphones in the coming weeks to resolve various issues spotted by early adopters. Starting with the Pixel 2 XL, Google says it will give users more options to tweak the screen's color through a tool added to the display settings. Pandora today rolled out a new way to enjoy streaming music on mobile devices. Moving forward, people who use Pandora's free, ad-supported service will be able to listen to a specific song, album, or playlist after viewing a 15-second video ad. Google today announced a new batch of Pixel phones, including the Pixel 3 and larger Pixel 3 XL. The phones will come in sand, black, and white.